Photo of the W3C Social Web Working Group taken at Face to Face Meeting, 2015-03-18 at MIT. The Social Web Working Group's second face to face meeting is in MIT, Cambridge, MA, USA on 2015-03-17 and 2015-03-18 . Food throughout the day will be provided, courtesy of QCRI. Additional beverages and food are available for sale in the café on the ground floor of the building and nearby. There is a small Starbucks counter and a cafeteria on the first floor of the Gates tower (around the corner from the ATM machines in the Stata Center lobby near the information center). There will be wireless Internet access. The Stata Center can be a bit confusing as there are two towers: Gates and Dreyfoos, each with its own bank of elevators. Although this meeting is in D463 (in the D (Dreyfoos) tower), because of the layout of the fourth floor, you can use either set of elevators. D463 is just off the large dining area in the center of the building, and there are signs for 32-D463 in many places. 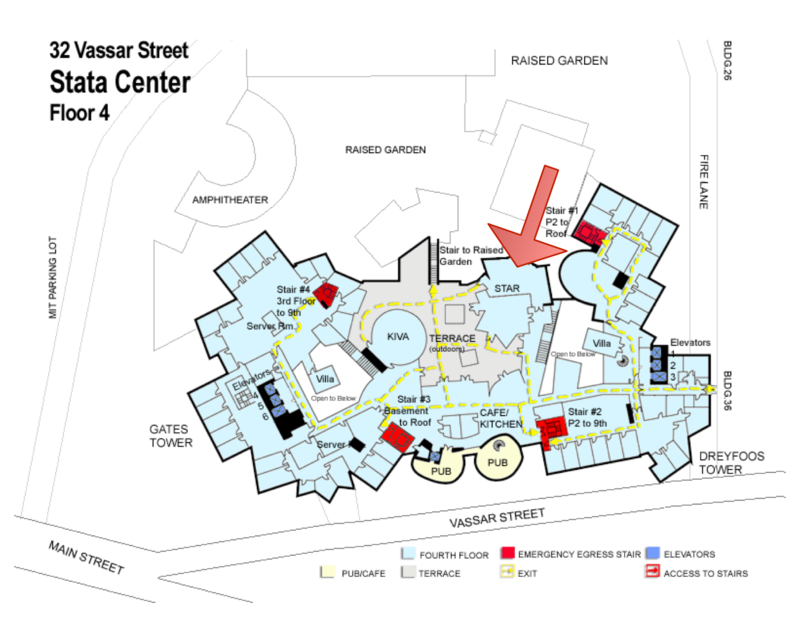 See the 4th floor map or if you really want: video of walking from Main & Vassar. The building is on an automatic locking system. Doors to the elevator foyers on the 4th floor will be open during the workday but the stairwells automatically lock at 5pm (with the only unlocked exit door on the first floor). Please be careful of your belongings even when stepping away even for a short while. The building is open to the public and there have, unfortunately, been thefts. The MIT Computer Science and Artificial Intelligence Laboratory (CSAIL) is located at the northeastern edge of the MIT campus on Vassar Street near the intersection with Main Street. Boston Logan International Airport is the closest international airport to MIT. The travel time between the airport and hotels in Cambridge will vary between 30 minutes to one hour depending on traffic conditions. Taxis from the airport are plentiful and fares will range around $30-40. The Stata Center is located a few blocks away from the MBTA Red line Kendall/MIT stop (directions). We strongly suggest that visitors use public transportation. Alternately, several of the the hotels provide shuttle service to MIT. Information on parking is located below. The MIT Parking and Transportation Office does not offer pay lots for visitors. They note: "Because the number of visitor parking spaces on campus is limited, it may not be possible to accommodate every visitor who wishes to park at MIT.... We strongly recommend using public transportation when visiting the MIT campus." There is hourly on-street parking available around the Stata Center though Cambridge is a busy area and parking may be difficult to find, especially in inclement weather. Information on paid parking lots near campus can be found on MIT's parking site. MIT also has a list of nearby hotels. Boston has received a fair bit of snow and cold temperatures should still be expected (see the local weather forecast) so please remember to bring warm clothes - boots, hats, gloves and a coat are appropriate for the outside and extra layers would be good to have inside the building. Consider also signing up to participate in IndieWebCamp on Thursday and Friday immediately following the Social Web WG f2f. Many of us are attending both. Determine steps to get Activity Streams 2.0 CR. Being edited. The times and general subject areas are largely set - please do not edit them directly but instead make suggestions in the "Additional Items" section below. If you have items specific to the general subject areas, feel free to add them as list items inline under that subject area, and the chairs will help prioritize them with f2f participants. ISSUE-7 Are AS consumers required to understand the pre-JSON-LD syntax? Demos of API Candidates showing User Stories on people's actual decentralized (personal) social web sites to help ground discussion of API Candidates. One line per tool (client of server) you plan to demo. St. Patrick's Day, Boston, Irish style. JJ Foleys, Kingston St, Boston -- take the Red Line to downtown crossing. No food coloring or anything weird! More demos of API & Federation Candidates showing User Stories on people's actual decentralized (personal) social web sites to help continue discussion of API & Federation Candidates. One line per tool (client of server) you plan to demo. Andrei Sambra, What: privacy-aware, decentralized Linked Data apps that store data on the user's server, Data storage: decentralized generic data servers (gold, ldphp), using LDP 1.0 + improvements. Social API evaluation criteria and next steps. Straw proposal to create a matrix of support of user stories with permalinks to post results - no resolution. ACTION-44 Collection - compare AS2 design with LDP, Hydra, Schema.org etc. IndieWebCamp Cambridge 2015 day 1, also at MIT. IndieWebCamp Cambridge 2015 day 2, also at MIT. This page was last modified on 8 December 2015, at 20:11.